Crash Bandicoot is back with a whole new make over. 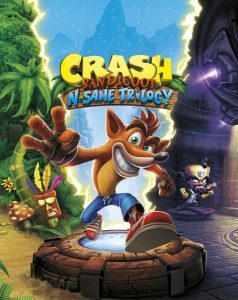 Activision brings us the three original games that originally came out in the 90’s, Crash Bandicoot, Cortex strikes back and Warped. Does this hold the nostalgic feelings we deserve or does it leave us frustrated with no end to be seen? let’s find out. Crash Bandicoot is a wonderful platformer that took me back to the days of Mario, Donkey Kong & Mega Man. Your evil nemeses in these games, of course, is Doctor Neo Cortex who is trying to get all the power crystals, so each level you go through in the second & third game collecting those power crystals is a must; other than that getting from the beginning of the level to the end is the main goal, and defeating enemies by jumping on them or spin attacking them is just awesome. That is only the tip of the ice berg when it comes to these games collecting apples to get enough for extra lives, destroying all the boxes for an extra gem at the end of the levels. Let’s talk about the levels, some of the levels in this game are absolutely gorgeous when it comes to the new design and updated graphics; with that being said some of the levels are so difficult in parts it will make your turn gray if you are in your twenties like me, some of these levels would take me up to forty-five minutes to beat but none the less I had a great time with them and the game took me less than a week to beat which is great. I never got bored I was being challenged but not to the point where I wanted to give up. I found as the games went along though they were getting easier, I don’t know if that is because I was getting accustomed to the challenge or if they were made intentionally to be easier. The N Sane trilogy may have been beaten but it will not soon be forgotten it is everything I needed in a game right now, it may have been frustrating at certain points but I had fun every step of the way.